I help people be their best selves + live their best lives through yoga, meditation, and mindfulness. Join the tribe for access to my library of sequences + journaling worksheets, weekly yoga + meditation videos, and the tools + support to be your best self and live your best life! 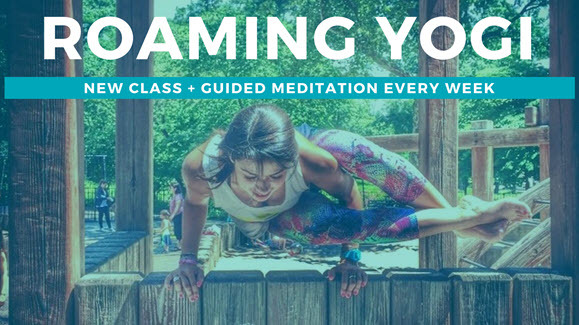 I share a new class every week on the Roaming Yogi YouTube channel. Join the 7-day morning yoga experience to start each day with mindfulness + intention. 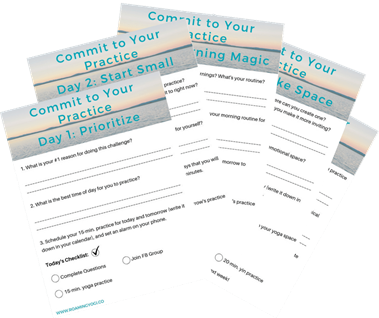 with daily worksheets to help you commit! Natalie is an amazing yoga teacher. She creates thoughtful and beautiful sequences but also reads the room and can adapt to whatever her students need. I love taking her classes because I know I will get a great fiery practice with a lovely cool down. Also she does really interesting meditations that help you to let go during savasana. Yoga with Natalie is always a joy. I love her classes for their challenging, yet accessible nature. Her thoughtful sequencing and delicious pace always leaves me feeling wonderfully centered and peaceful. Plus, her singing voice is amazing - nothing is better than getting sung out of Savasana! Natalie Perez is an exceptional teacher. I always learn something in her classes, and love practicing with her. She is incredibly knowledgeable, especially with regard to anatomy and alignment. Her classes are fun, challenging, dynamic, and magically sequenced. Natalie is conscientious, humble, attentive, and just downright sparkly. Natalie is a small but mighty storehouse of spiritual knowledge. She leads a beautiful and strong practice with her sweet voice and when she chants mantra, you will know she is guided by a higher force.